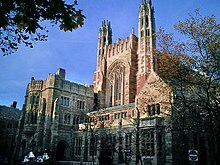 Yale University is an American private Ivy League research university in New Haven, Connecticut. Founded in 1701 in Saybrook Colony as the Collegiate School, the University is the third-oldest institution of higher education in the United States. 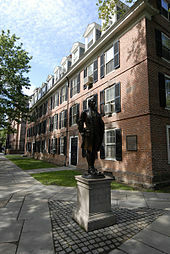 The school was renamed Yale College in 1718 in recognition of a gift from Elihu Yale, who was governor of the British East India Company. Established to train Congregationalist ministers in theology and sacred languages, by 1777 the school's curriculum began to incorporate humanities and sciences. In the 19th century the school incorporated graduate and professional instruction, awarding the first Ph.D. in the United States in 1861 and organizing as a university in 1887. 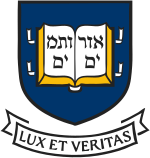 Yale is organized into fourteen constituent schools: the original undergraduate college, the Yale Graduate School of Arts and Sciences, and twelve professional schools. While the university is governed by the Yale Corporation, each school's faculty oversees its curriculum and degree programs. In addition to a central campus in downtown New Haven, the University owns athletic facilities in western New Haven, including the Yale Bowl, a campus in West Haven, Connecticut, and forest and nature preserves throughout New England. 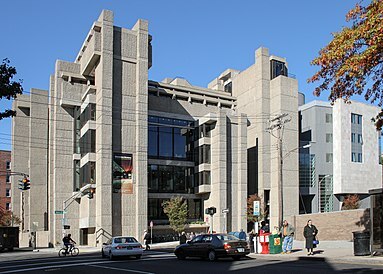 The university's assets include an endowment valued at $25.6 billion as of September 2015, the second largest of any educational institution.The Yale University Library, serving all constituent schools, holds more than 15 million volumes and is the third-largest academic library in the United States. 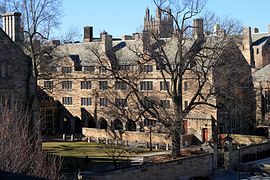 Yale College undergraduates follow a liberal arts curriculum with departmental majors and are organized into a system of residential colleges. Almost all faculty teach undergraduate courses, more than 2,000 of which are offered annually. Students compete intercollegiately as the Yale Bulldogs in the NCAA Division I Ivy League. Yale has graduated many notable alumni, including five U.S. Presidents, 19 U.S. Supreme Court Justices, 13 living billionaires, and many foreign heads of state. In addition, Yale has graduated hundreds of members of Congress and many high-level U.S. diplomats. 52 Nobel laureates, 5 Fields Medalists, 230 Rhodes Scholars, and 118 Marshall Scholars have been affiliated with the University. Yale traces its beginnings to "An Act for Liberty to Erect a Collegiate School," passed by the General Court of the Colony of Connecticut on October 9, 1701, while meeting in New Haven. The Act was an effort to create an institution to train ministers and lay leadership for Connecticut. Soon thereafter, a group of ten Congregationalist ministers: Samuel Andrew, Thomas Buckingham, Israel Chauncy, Samuel Mather, Rev. James Noyes II (son of James Noyes), James Pierpont, Abraham Pierson, Noadiah Russell, Joseph Webb and Timothy Woodbridge, all alumni of Harvard, met in the study of Reverend Samuel Russell in Branford, Connecticut, to pool their books to form the school's library. The group, led by James Pierpont, is now known as "The Founders". Originally known as the "Collegiate School," the institution opened in the home of its first rector, Abraham Pierson, in Killingworth (now Clinton). The school moved to Saybrook, and then Wethersfield. 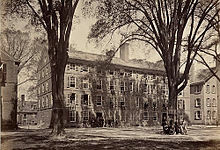 In 1716 the college moved to New Haven, Connecticut. Meanwhile, there was a rift forming at Harvard between its sixth president Increase Mather and the rest of the Harvard clergy, whom Mather viewed as increasingly liberal, ecclesiastically lax, and overly broad in Church polity. The feud caused the Mathers to champion the success of the Collegiate School in the hope that it would maintain the Puritan religious orthodoxy in a way that Harvard had not. What are the academic rankings for Yale University? 1. number 3 for Academics. 2. number 37 for ROI (Return on Investment). What universities are similar to Yale University?